This is an entirely experiential film: the cameras never leave the valley; there are no interviews with generals or diplomats. The only goal is to make viewers feel as if they have just been through a 90-minute deployment. This is war, full stop. Amazing and tastefully done documentary film. I saw this in the theater and can’t wait to get my DVD. 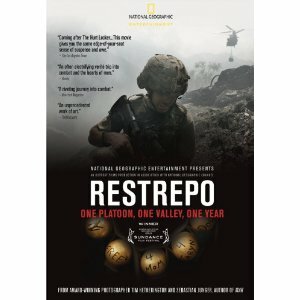 I highly recommend seeing Restrepo. Available on December 7, 2010. Pre-orders online until then. I heard is a great documentary movie, but my son who is in the Army does not want me to see it, I wish but I will listening to him, I have to show respect for what he said to me, I love my son so much and I love all the soldiers, GOD BLESS THEM !!! !